While there's been a lot of attention paid lately to association and short-term health plans, there's another option that's largely flown under the radar. Healthcare sharing ministries are exactly what they sound like; plans that gather the resources of a group of people with common religious beliefs. And they've been growing at a rapid pace. The plans are estimated to cover nearly 1 million people across the country. Just three years ago, that number was at 160,000. 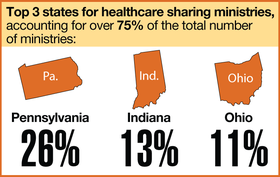 Here are some more useful numbers to consider when trying to understand healthcare sharing ministries. Download the PDF.